Dream Team: Appalachian State University students envision, design, and build a self-sufficient home in hopes of earning top honors. T.S. eliot contended “time future is contained in time past.” And in that spirit, a team of innovative students at Appalachian State University looked back to frontier days, when isolated pioneer homesteads dotted the mountains, for inspiration in the creation of a home that embraces the possibilities of the future. This month, their design house goes up against nearly 20 other teams in the U.S. Department of Energy Solar Decathlon, a highly respected international competition that challenges collegiate teams from around the world to design, build, and operate solar-powered houses. They are charged with making the dwellings cost-effective, energy-efficient, and attractive. 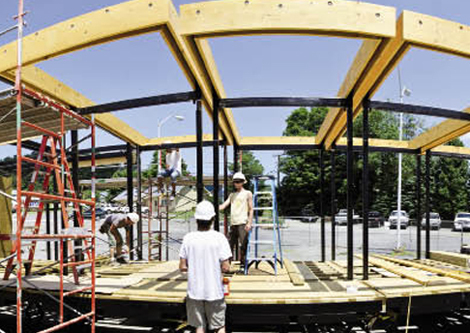 That sole missing element clearly cannot diminish this massive paper-to-reality design and construction undertaking that began in 2009, and culminates in late September when the team transports its 864-square-foot Solar Homestead to Washington, D.C., and erects it on the National Mall. There, it will be subjected to a series of 10 contests that evaluate the house’s aesthetics and measure its performance. In addition, the homes will welcome the public in an open house, which attracted more than 300,000 visits during the last competition in 2009. For the project, the team drew inspiration from the self-sustaining nature of early pioneer homesteads that commonly were comprised of a main house and outbuildings. The resulting design deftly combines frontier spirit with innovative technology and renewable components. In this design, the traditional outbuildings have become outbuilding modules, or OMs, which are modeled after lean-to sheds, but function as stand-alone solar collection units that supply power to the dwelling. Countering the common perception that solar features aren’t aesthetically sensitive, the OMs add architectural interest as a frame for the porch, which is topped with a solar canopy. The easily transportable OMs can be used as garden sheds or picnic shelters. There is also a Flex-OM, a 120-square-foot conditioned space that operates independently of the main structure and can serve as an office or guest quarters. The two-bedroom, one-bath main dwelling features a light-washed and surprisingly spacious living area that allows easy conversion for a variety of uses. Pocket doors pull out to hide the kitchen, for example, and create a screen, converting the space into a media room, thus fulfilling the competition’s requirement that the dwelling contain a home entertainment system. To maximize the space, the furniture serves multiple purposes: Two tables that help define the dining room and a separate eating nook can be reconfigured to provide seating for eight, so the team can host two required dinner parties. Even in the smallest of spaces, ingenuity is incorporated. In the bathroom, sunlight filters through a solar-thermal skylight, which heats water for the home. Perhaps most important, the Solar Homestead is designed to produce all the energy needed to run it, proving the viability and environmental benefits of such approaches and techniques. The project went from design to construction inside a former auto dealership in Boone, where a swarm of students worked almost nonstop to build the home and its systems. Students not involved in the construction process contributed everything from website design to custom furniture, pottery, textiles, and the dinner menus. And this competition requires more than a model—the various energy-producing technologies must function properly, and the building must withstand the rigors of thousands of visitors while on display. This meant the Solar Homestead had to be constructed and tested in Boone, before being dismantled and shipped to the National Mall. The project isn’t inexpensive, with the total cost projected to top $900,000. In addition to support from the university, the Solar Homestead has received sponsorships and donations from local and regional businesses and organizations. Take a virtual tour of the Solar Homestead at www.thesolarhomestead.org. To learn more about the Solar Decathlon, visit www.solardecathlon.gov. The Verdict is Out (October 2, 2011): ASU's Solar Homestead won the People's Choice Award and placed 14th overall in the judging. Congratulations to the ASU Solar Decathlon team!